Exciting news for those of you who like to get outside and experience nature at its best — the Point Lookout Trail in McDowell County opens October 30. Point Lookout Trail is a 3.5-mile paved biking/walking path surrounded by Pisgah National Forest and barricaded to motorized vehicles at both ends. It was formerly part of Old US Highway 70, winding through the woods with serene views of the mountains, railroad and forest. Now, it will be a greenway that allows people to take in the fresh mountain air, get a little exercise and still see those fabulous views. And it’s just down the road from the Inn on Mill Creek. 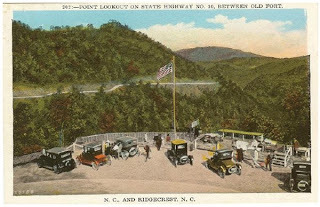 Groups that made it all happen include the North Carolina Department of Transportation, the McDowell County Board of Commissioners, the McDowell County Tourism Development Authority, the Town of Old Fort and the McDowell Trails Association. We’ll be attending the ribbon cutting ceremony on October 30, and we’ll post photos of the event in our Saturday blog. This entry was posted in Uncategorized and tagged hiking, Old Fort / Andrews Geyser, outdoors by Inn on Mill Creek. Bookmark the permalink.